This past weekend, Jordan Peele’s second feature film Us opened to record numbers at the box office, once again proving our confidence in his talent as well as the need for more horror. His latest contribution takes another look at (North) American culture, but this time it’s a deep dive into who we see in the mirror and what we actually are. Adelaide Wilson (Lupita Nyong’o) and her family are on their summer vacation. She heads to her beach home along with her daughter Zora (Shahadi Wright Joseph), son Jason (Evan Alex), and handsome, good-natured husband Gabe (Winston Duke). It’s a good life, but the visit to Santa Cruz, California holds some traumatic memories for her. She is tense as they meet up with friends Josh (Tim Heidecker), Kitty (Elisabeth Moss), and their twin daughters on the beach; and frantic when she loses sight of her son Jason who is transfixed by a bloodied, jumpsuit-clad man gazing into the horizon. Later she tells Gabe about an incident that left her traumatized as child when she met her double in a creepy fun house on that very beach. She feels the double is still around and watching her. That evening, her worst fear is realized when her doppelgänger, and carbon copies of Adelaide’s family, appears at their home. They are called the Tethered from an unknown underworld, and they are set to terrorize the family for a larger purpose. Adelaide and her terrified family. I had to collect my thoughts on Us for several days. I left the theatre feeling overwhelmed by the images flashed on the screen, like a rich meal sitting on the palate hours after consuming. I felt uncertain, wondering if this feast for the eyes was going to sit right; if I would like it and want another serving, and I’m pleased I can say yes to both. There are layers and layers of themes to be discussed, and you’ll find wonderful pieces online covering doppelgängers, the biblical passage of Jeremiah 11:11, and double consciousness, but what came to the surface for me was class and Impostor Syndrome. First, some other thoughts: Peele’s central protagonists are members of a black family, leveling the playing field for me so I could concentrate on other aspects of the film like the narrative and subplots. I could actually relax into the experience instead of wondering in the back of my mind what it would be like to have a black performer play the role of Adelaide if Us had an all white cast. I’ve mentioned before in my review of the documentary Horror Noire that I felt a certain anxiety over black characters in horror because they fulfilled tropes and stereotypes instead of proper representation. Here, Peele provides a master class in representing black culture; normalizing it instead of mimicking stereotypes and appropriation. You can see this in his organic use of the song “I Got 5 On It” and the Howard University sweatshirt – two feasible and easily believable “black” signifiers. This middle-class black family defies Hollywood’s representation of blacks. There’s no guns, gangs or prostitutes, just family trauma. He also normalizes the fact that young Adelaide’s mother is concerned with her well-being enough to take her to a therapist instead of asking her to pray for guidance, an interesting secular aspect even though there is a larger biblical theme of doom and gloom connecting the plot of the film. The performances were fantastic, and just what you would expect from Peele as a director. The film itself was funnier than I anticipated, with Duke’s endearing and heroically bumbling Gabe and the great chemistry between Joseph and Alex as siblings. All eyes, however, are on Nyong’o. Her skill at becoming two completely different people is boundless. From facial and body tics to genuine menace, she clearly shows her attention to detail and the love of her craft. Her duality is, of course, central to the film and affected me the most. If you’ve seen the film, you know that Adelaide was once a Tethered, and switched places with the real Adelaide, now called Red, when they were children. America is the land of opportunity where the fittest will survive, and Adelaide’s switch is a great allegory for the opportunistic mentality of people’s drive to get what they want. She got herself out of the tunnels and into the real world. As a result, Adelaide is constantly looking over her shoulder because she knows she isn’t in her rightful place, and she is truly an impostor. I’ve had that same feeling because Impostor Syndrome started early for me. Growing up in a white neighbourhood, I was faced with the guilt of not living in the community housing with the other black kids, and the perpetual knowledge that my family was treated like we weren’t supposed to be in the white neighbourhood. I felt clumsy in my portrayal of a black girl, not knowing the right way to finally be accepted because the black kids were suspicious of me, and the white kids said I really wasn’t black because I didn’t fit their white supremacist rules of blackness or class. I was playing a role in each arena and not getting it quite right, like Adelaide trying to snap in time to music. To add to this feeling of a fraudulent existence, my mother told me to keep my head down and behave because if something went wrong, black children would be blamed first. She did this to protect her black daughters in an unforgiving world, but it was a cardinal rule that boxed me in with expectations and dread. Like Adelaide, I had to keep myself in check, worried that my carefully constructed world of avoidance wasn’t enough to protect my fraudulent roles, and wondering whether I would ever show my true self; if I even knew who I really was. I understood Adelaide protecting her status, identity and American Dream; to deal with her secret plus the weight of heading a successful black family. Red and her doppelgänger family. Adelaide escaped the Tethered, a forgotten people, left to fend for themselves once the government experiment they were a part of went awry. They mimicked the upside world, every move warped, with no hope of escape. This hidden society, this powerless class found a leader in Red, who saw her opportunity to rise up and revolt by planning her own revolution based on one of the few things she remembered from her childhood, Hands Across America. This charity event to help the homeless meant well but was a bust in the end. She planned to make her version a success for her fellow Tethered and regain her identity from Adelaide, driven by her entitlement to her real life. I sympathized with Red too, since her rightful place was taken from her. This jockeying for a prime position created the ultimate showdown between a woman and her double, in a world full of hidden meanings, our darkest fears and deepest secrets. The scope of Us is vast, and whether you see it as a battle between our worst selves, our fears, classes, or a biblical reckoning, it’s a literal rabbit hole of self-reflection everyone should fall down and get lost in over and over again. I used to work in a library situated in Toronto’s Little India, where I would come across a heavy rotation of Bollywood DVDs, magazines and TV series. I finally took the plunge one day after asking a co-worker what she would recommend and was seduced right away. From comedies like Kuch Kuch Hota Hai (1998), to traditional love stories like my all time favourite Taal (1999) and yes, the songs still make me cry, those colourful cinematic smorgasbords with dancing and singing interjected into the meat of the film worked their way into my heart. Bollywood has been throwing its hat into the horror ring for decades too, with 1949’s Mahal, said to be the first true Hindi horror film, the ghostly comedy Bhoot Bungla from 1965, and coming to the forefront in the 70’s with the Ramsay Brothers fun and schlocky low-budget horror films. There are a couple of cool short YouTube clips about the brothers and their impact on the horror genre in India: Part One and Part Two. They opened the floodgates for modern horror, and now there are many, many films drawing on things that go bump in the night Bollywood style. One of the more memorable films for me is Bhoot (Ghost). Directed by Bollywood’s controversial horror maverick Ram Gopal Varma, this 2003 multiple award winner tells the story of a man who scores an apartment for a steal due to its previous resident’s suicide. Things get weird when his wife is tormented by the former resident’s ghost. It impressed me with the creepy atmosphere, nary a traditional musical number, and could stand up to any J-horror at the time. Unfortunately, I would soon change jobs, and access to films weren’t as easy as sifting through returned items. I fell off the Bollywood bandwagon until my sister, who still has her finger on the Bollywood pulse, recently passed 2013’s Ek Thi Dayaan (There Was A Witch) my way. She swore up and down that it was one of the better, less schlocky horrors she’s seen in a long time, so the horror boyfriend and I settled in for the 2 hours and 15 minutes of foreign horror fun. Adapted from a short story Mobius Trips by Mukul Sharma, Ek Thi Dayaan tells the tale of celebrity magician Bobo the Baffler (Emraan Hashmi), India’s answer to Criss Angel and David Blaine, who has a dark past. He’s haunted by his sister Misha who died when he was just a boy, but he can’t remember any details of her death. His doting girlfriend Tamara (Huma Qureshi) wants to get married and adopt Zubin (Bhavesh Balchandani), a boy they befriended at a nearby school, but his distant demeanor and jumpy nature puts a damper on their plans for the future. To move forward, Bobo decides to get to the bottom of his fears. Visiting his childhood psychiatrist, he succumbs to a hypnotic trance to access those memories. Those memories leave him even more confused than before, but he pieces enough together from his buried past. After losing their mother, 11-year-old Bobo and his younger sister (Sara Arjun) try to make a life for themselves with their doting father Sharan (Pawan Malhotra). Bobo is preoccupied with a book on the occult, and decides that a finicky elevator in his building is a direct ride to Hell. When he and his sister fool with the elevator, a mysterious woman named Diana (Konkona Sen Sharma) appears. She immediately charms his father who invites her to be their governess, and soon his wife. Bobo is determined not to like her, and mistrusts her to the point where he believes she is a witch and out to sacrifice them. When a double tragedy destroys the family forever, Bobo has to face his childhood delusions and trust that the deaths that stole his innocence and family wasn’t the end result of supernatural forces. That’s the film in a spoiler-free nutshell, but there are plenty of juicy details in between. Being a Bollywood film, there’s a quick interval between the first and second hours (which is actually a shorter film than usual. Most clock in at 2 ½ to 3 hours). In this case, it’s as if director Kannan Iyer presents 2 different films. Bobo’s recounting of his childhood has a Harry Potter-esque feel to it, while the second half embraces a more traditional horror film, bringing up distant comparisons to Rosemary’s Baby, and even Anabelle. Once you get past the slightly ridiculous name of the main character and focus on the musical numbers (of course! ), some cool special effects and fun jump scares, you’ll find yourself with a great contemporary South Asian horror film. While the story gets a bit patchy from time to time, the production value is fantastic, and the performances aren’t of the usual Bollywood fare; bringing a touch more substance than you would expect. It seems that the horror genre gives a lot of theatrical wiggle room for the performers to explore. The kids in the first half were quite good, and there’s some great possession performances later on in the film. One fun fact that caught my eye was the disclaimer at the beginning of the film stating that the filmmakers don’t stereotype women as witches. This strikes me as a really interesting angle. Even though the witch myth has been used to keep women’s power at bay, from a feminist view, the disclaimer actually acknowledges the mistreatment of women throughout the ages globally, and specifically in India, that have been ostracized or accused of being witches for being childless, widowed or single. In a 2013 interview, Iyer mentions that he went to great lengths to avoid the typical village dayaan or witch folklore, and the disclaimer also puts an enlightened spin on it as well. While Robert Egger’s The Witch (2015) divided a whole legion of horror fans, I think Ek Thi Dayaan is a supernatural crowd pleaser that bypasses the usual Bollywood melodramatic themes and gives you lots of witchy chills. It’s got some decent horror aspects, a great plot twist and a haunting theme song you’ll catch yourself humming as the end credits roll. *I mentioned the singing and dancing in Bollywood films, but movie music is actually a huge industry in India. In most of the films, the songs are sung by “playback artists”, or professional session singers while the movie stars lip sync the lyrics. The songs are just as important as the film itself, with a soundtrack often being the driving force for making a film a box office hit. Composers and singers like legendary A. R. Rahman, Lata Mangeshkar and Asha Bosle created memorable melodies marking a film’s time in the spotlight. Ek Thi Dayaan is no exception. Here’s that haunting theme song Kaali Kaali sung by Clinton Cerejo and written by well-known composer and director Gulzar. It basically talks about the magic a man finds in his lover’s eyes and how he’s bewitched by her and the treasures she hides there. It’s actually much more romantic with the full translation, which you can find here. It’s no surprise that death is devastating for those in mourning. Missing loved ones who have passed on comes in many forms but most of us would confidently say that faith (or lack thereof) aside, we don’t really know what happens to our soul after the physical body ends. In Personal Shopper, we see one woman’s struggle with the death of her twin brother and her belief in the afterlife. It brings to light deeper questions about life and death staged before the backdrop of Paris, the fashion world, and its trappings. Maureen (Kristen Stewart) works for a self-centered celebrity and socialite Kyra (Nora von Waldstätten) as a personal shopper. Her job is to find the latest and greatest in high fashion and bring it back to her famous employer since her high profile makes it impossible to shop anonymously. Maureen has also recently lost her twin brother Lewis to a heart defect she also suffers from. His surviving partner Lara (Sigrid Bouaziz) wants to sell their house, but Maureen who is a medium, insists that Lewis will send her a sign from beyond, so she spends a few nights in his crumbling house waiting for him to appear. He was a medium like her, so her determination is fueled by his once stronger psychic abilities and their vow to make contact from the other side. When she does contact the spirit world, she also receives mysterious text messages topped off with an unexpected murder that stops her in her tracks. Maureen’s quest for answers becomes more confusing, leaving her in a state of shock and floundering for answers. Kristin Stewart as Maureen waiting for a sign. Personal Shopper is a horror, a film noir, a psychological thriller, and a ghost story. It is all of the above and none of the above at the same time, embracing and defying genre. Director Olivier Assayas created a film that’s in a class of its own using art, history and old school paranormal beliefs with 21st century technology and lifestyles to illustrate Maureen’s search for her brother’s spirit. It’s this artistic take that kept me riveted despite the slow burn pace. Assayas captures Maureen’s loss well, and he also conveys the loneliness of this technological age we live in with Skype and smartphones being key methods with which she communicates. Even when she is with someone physically or electronically, she is separate, guarded, or unsure; from her shopping excursions to her Skype dates with her boyfriend. The smart phone as a thing of necessity in this day and age to stay tethered to this world also becomes an agent of isolation and intense paranoia when Maureen pleads with a nameless messenger behind the texts to reveal themselves. Assayas takes a now commonplace device and gives it a more otherworldly, sinister presence. Personal Shopper is also a lesson in how Maureen grieves. She throws herself into her work even though she flat out hates her fashionable job, but Paris is her main connection to her dead brother so she stays there as she waits for a ghostly sign, not ready to let go. The world of fashion is a fleeting one; rarely delving deeply into the reality around it. Her psychic abilities seem to be stunted as she moves between posh shops in London and Paris to serve Kyra in this superficial arena. It shows how she herself seems like a spirit as she is lost between real life, the supernatural, the fashion world, and her uncertainty with what she believes and how she is perceived. Her only moment of self-awareness comes when the mysterious messenger asks her to do something forbidden, and she taps all too briefly into her desires in her confused and somewhat desperate state. It’s a strange moment in the film, but it makes sense as her character searches for a right fit, so to speak, in environments that while not hostile, aren’t hospitable to her either. The look of the film is really beautiful. Yorick Le Saux, the cinematographer for Only Lovers Left Alive, does a wonderful job capturing the contrast of the dingy streets and stark sophistication of Paris. He is skilled at making the most of each setting, representing streetscapes and boutiques in their truest and most tangible forms. For anyone that has visited the City of Lights, you’ll feel nostalgic for its frenzied energy. My only issue lies with the text messages and some of the ensuing actions asked of Maureen. While I really enjoyed these suspenseful interludes and there is definitely a point to them, they were problematic with some details that still remain unclear when the storyline makes a sharp turn. Stewart’s stellar performance as a tortured, uncertain and lost character written for her by Assayas, evokes a surprising amount of emotion that overshadows any inconsistencies in the narrative however, as you watch this poor soul wait for her brother to tell her something, anything as proof of an afterlife. Personal Shopper is an artistic take on a ghost story and focuses on one woman’s uncertainty when mortality comes into question. See this film for it’s beautiful photography, a haunting performance from Stewart and an interesting albeit imperfect story about grief and the afterlife. The buzz has been on about Get Out since late last year when it was announced that Jordan Peele, award-winning comedian and actor know for the hit comedy series Mad TV and co-creator of Key and Peele, had written and directed his first film, and not only was it a horror, but it carried a message . The hype machine ran rampant with accolades as usual, but this time, it was right. He’s made an excellent horror film that illustrates an everyday fear and paranoia once thought to be exaggerated by most, but now (one would hope) most likely understood by all in today’s politically and racially charged world. Chris Washington (Daniel Kaluuya) is a young photographer preparing to spend the weekend with his girlfriend Rose (Allison Williams). They plan to visit her parents out of town, and Chris is concerned because Rose, and her family, are white, and he is black. When she reassures him that her parents will happily accept him into the fold, they head up her family estate. After a jarring experience hitting a deer and dealing with suspicious local police, Chris attempts to keep his cool as he is interrogated by Rose’s parents Missy and Dean Armitage (Catherine Keener and Bradley Whitford) and her strange brother Jeremy (Caleb Landry Jones). Things get even more awkward when a yearly party with their old school family friends conveniently takes place during their weekend visit. Chris feels not only alienated and scrutinized during his time with Rose, her family, and their white friends, but also that something isn’t quite right. When his interactions with the extremely odd black house staff Walter (Marcus Henderson) and Georgina (Betty Gabriel) and a black guest (Lakeith Stanfield) at the party go south, his “spidey” senses tell him all isn’t as it seems at the Armitage gathering. Get Out bridges horror with a mixture of Hitchcock-style suspense and Twilight Zone weirdness, nailing the daily horrors of being a person of colour navigating a systemically racist society at large. The social commentary was so well done that everyone person of colour can nod their heads as they relate to the micro aggressions in the film that are dealt with daily, in fact, there are many themes I want to touch on, but I’ll try to make each observation brief. A young African-American man, an anti-everyman who is both feared and envied, as the vessel to convey the current social climate was bold, brilliant and well needed. Not since Night of the Living Dead’s Ben (Duane Jones) and that film’s supposed accidental social commentary during the Civil Rights era have we seen such a memorable character. Chris embodies the aspirations of every young Black man and woman who just wants to live unafraid and with all the same opportunities afforded to everyone else in the country touted as “the land of the free”. It’s a heavy load to bear, but Kaluuya plays the character to a “T”. I first saw him as a teenager in a British series called The Fades, where he played the best friend of a boy who had supernatural powers. Kaluuya was hysterically funny then, and his humour has matured with his portrayal of Chris that dripped with irony, while capturing the sincerity and sensitivity of a young man at odds with his acceptance in a literal and figurative sense. I also thought it was clever to make Chris a photographer as we see through his literal lens and point of view. Chris’s friend Rod (LilRey Howery) creates comic relief not to be missed as he personifies Chris’s inner voice telling it like it is. He’s a throwback to the “Black person in a horror film” joke. I was also thrilled to see Erika Alexander from the 90’s sitcom Living Single as the detective Rod tries to enlist for help. I thoroughly enjoyed the Armitages as well. Keener and Whitford played the slightly off liberal parents with a subversive finesse, bringing to light Peele’s skill at writing them with a complexity that is not often expressed properly. Here, they represented the ingrained ignorance of whites as they assert their supremacy over people of colour without any thought to the person in front of them. It’s a brilliant display of how intent is often masked with a cloak of inclusivity, but only on their terms. While a generalization of White society, it also embodies how Blacks, and people of colour in general, have to pick our battles daily while struggling to keep and define our identities at the same time. Peele’s use of an interracial relationship as the vehicle for his premise is a no-brainer. Where else can you question your place in society than with two people taking a chance and presenting themselves in the world as they defy archaic social norms? It plays on the paranoia, defensiveness and potentially hidden agendas for those involved in interracial relationships. Lastly, the film is visually simple and clean, with nice camerawork and set design that stood out as effective signifiers of old money and privilege. He also treated Chris’s loss of control with dream-like sequences that were some of my favourite scenes and reminded me of the underrated Under the Skin. Jordan Peele succeeds in giving us a smart, well-written thriller/horror filled with a great balance of tongue-in-cheek humour and a viscerally intense uneasiness. Without giving away spoilers, he captures the need for the incessant and historic commodification, exploitation and abuse of African-American lives (literally and figuratively) with no consequence felt by those exploiters in this supposedly “post-racial” world. See Get Out and discuss how it makes you feel with everyone you can. Perhaps a film created in a genre that is not usually accepted about a historically ostracized/demonized/shunned yet culturally mined people can open the doors to some sort of social justice, and maybe, just maybe, we’ll see the face of mainstream horror (and film at large) change. The wait is finally over. Part 2 of The OA will air on Netflix March 22nd and I couldn’t be happier. This strange show left us hanging with a dramatic ending and lots of questions, and I’ve been obsessed with a theory about it for a long time, so my hope is for answers and more intrigue in a few weeks. There’s been lots of speculation on The OA. Created by Brit Marling, who plays the protagonist Prairie/The OA, and her director Al Batmanglij, it tells the story of a woman who comes back to her family after a lengthily disappearance, once blind and now with her vision restored as well as an unbelievable tale to tell. There have been countless theories (even ones comparing it to Stranger Things which is a stretch in my opinion), including obvious references to the classics like Homer blatantly pointed out in the series, and religious overtones-The OA stands for Original Angel-but I feel the show is connected to Peter Pan. It may sound absurd, but many instances in the narrative echo the classic story of a boy who never grows up and his many adventures in Neverland. While the similarities aren’t obvious or linear, shadows of this classic book and play with Pan typically portrayed by a woman, take Prairie from an innocent to a captive; then to a lost soul, and finally a powerhouse of belief and faith, a theme that also runs through Peter Pan. The show starts in Russia with Nina, a girl raised by her wealthy and doting gangster father who teaches her important life lessons about survival and trust. When she is a victim in a terrible bus accident, she experiences a near death experience and meets a mysterious entity, Khatun (Hiam Abbass), who gives her a choice of living beyond the earth or going blind so she can stay with her father in the mortal world. She chooses the later because she loves her father dearly and can’t imagine being separated from him. When she is well enough, he sends her to the U.S. to keep her from his shady lifestyle and also to attend a prestigious boarding school for the blind. After her father is reported dead, his sister-in-law takes in Nina, but it isn’t an easy life for the little girl as her aunt is involved in prostitution and baby trafficking. Abel (Scott Wilson) and Nancy (Alice Krige) wait for a child to bring home. An older couple, Abel and Nancy (Scott Wilson and Alice Krige), intent on adopting an infant boy from Nina’s aunt see Nina and fall instantly in love with her, taking her home instead. She lives a good life with them until she starts to have premonitions and episodes that doctors feel require medication. As Nina, now called Prairie, gets older, she still has premonitions that lead her to believe her father is still alive. On her 21st birthday, she decides to leave her parents to search for him. It is on this journey she meets a Dr. Hap (Jason Isaacs) who holds a sinister purpose for her. He befriends her and takes her to his secluded, underground laboratory where she and his other handpicked captives are forced to physically die in order to document the “other side” or a life after death dimension for him. She is released 7 years later by Dr. Hap, and returns home to her adoptive parents with her vision intact. Determined to find her fellow captives and rescue them from Dr. Hap, she enlists an unlikely group of high school misfits and their teacher to help her. She must get them to believe her story of captivity and travel to other dimensions, as well as teach them five “movements” that will transport her so she can rescue her captive friends. By now, I imagine you’re scratching your head over the Peter Pan connection, but stay with me. Peter Pan first comes to us in a book written by J.M. Barrie in 1911. This well-known character is a boy who flies away from his parents when he discovers he is part bird, going on many adventures. When he returns home, his parents have another child, and feeling unwanted, he flies away for good. He is the boy who never grows up and after his many travels and adventures, he loses his shadow in the home of Wendy, Michael and John Darling, three siblings whom Peter befriends. He wants a mother for his band of Lost Boys, and when he sees Wendy, takes her and her brothers to Neverland where he and his clan lives. It’s there that Wendy becomes a mother figure for the wayward boys and goes through many a trial and tribulation, from almost dying to being captured by the nasty Captain Hook. When she decides that she should bring herself and her brothers home, Peter Pan is against it, but seeing how sad Wendy’s mother has become without her children, reluctantly opens the very bedroom window he first flew through so they can all return home, including their newly found family the Lost Boys. Broadway star Sandy Duncan as Peter Pan. Now for the connections. My first clue was the fact that The OA, or Prairie, required her group of misfits to keep their doors open when she met with them for her nightly sessions to tell her tale, just like Peter Pan needed an open window to visit at night. The five people she gathers for her rescue mission are indeed a mixed bag, a set of lost souls that would fit right in with Pan’s Lost Boys. They each search for a purpose, and like the Lost Boys, they are either forgotten or misunderstood, trying to find something to believe in such a bleak environment. The OA and her band of Lost Boys. The second clue comes with Prairie/The OA’s disappearance. While she is not a child like Peter Pan when he disappears, she still returns feeling like an alien in her old world. She comes back as The OA with some childlike qualities, as if she has never grown up, and like Peter Pan, they no longer fit in the “real world”. Her spirit guide, Khatun, gives her a bird to swallow, imparting special powers to Prairie/The OA in order to help the other captives. When she returns from Khatun with this new power, there is a world-weariness to her that resembles maturity more familiar with Wendy than Peter Pan. She tells her five cohorts stories about her captivity and her life, much like Wendy tells stories to the Lost Boys and mothers them. She feels an obligation to find her fellow captives so they can escape Dr. Hap, who is her Captain Hook. But soon, the Wendy role is taken on by another character, Betty Broderick Allen (Phyllis Smith), the eldest of Prairie/The OA’s crew and teacher at the school the young misfits attend. She reluctantly tends to them when they aren’t with Prairie/The OA, offering advice when she isn’t dealing with her own issues and heartbreak. My third clue lies in the fact that Prairie/The OA avoids being touched and can “fly” between dimensions just like Peter Pan. She can also be just as disruptive much like the traditionally mischievous and arrogant figure of Peter Pan, finding herself in dilemmas by trying to help her band of misfits, like an attempt to stop one of her five cohorts from being expelled. She can be seen as leading the younger participants astray as she recounts her adventures and teaches them the mysterious movements to return to the lab and the afterlife. Clue number four? The show is filled with psychopomps. A psychopomp is a guide for the dead to reach their destination, found in many a mythology and religion like the Egyptian god Anubis, and the Archangel Michael. In The OA, we have Khatun, Prairie/The OA’s guide, who could also be Tinkerbell; Prairie/The OA herself, and the five captives of Dr. Hap as they make their way in the afterlife or Neverland. Peter Pan is also known as a psychopomp since he was believed to guide dead children to heaven. If psychopomps are guides, then they can also open doors. Both Peter Pan and Prairie/ The OA represent death and an entryway into another dimension. It is mentioned that Pan can “imagine things into existence and create windows and doors” just like Prairie/The OA perfects the five movements in order to transport herself to help her captive friends. It’s interesting to note too that each one of Dr. Hap’s captives sees a different afterlife. Neverland is also different according to the person who experiences it. Furthermore, if the lab is the place or vehicle to access Neverland, then Dr. Hap is most certainly Captain Hook, with his obsession to find the truth of life after death. Are the other dimensions like Captain Hook’s crocodile, elusive and dangerous; an unseen menace just out of reach in Dr. Hap’s research of the afterlife? The OA and a doorway to Khatun. The final clue lies in the finale. Peter Pan is all about the power of belief, from the moment he leads the children away to Neverland, to that pivotal moment when he calls on the dreamers of Neverland to revive Tinkerbell. Without giving away spoilers, the last episode of The OA spoke to me as I saw the five teens connect on faith alone to help Prairie/The OA realize a premonition. I felt a wave of emotion, actually moved to tears because in that moment I saw that we are all looking for our purpose; to believe in something that fuels our will to live, create, and love. My Peter Pan obsession is just one of many theories floating around out there, and I might be way off base, but I really love how this strange and very different show makes us think outside the box. So, while we try to figure out the mysteries of The OA, the next chapter nears, bittersweet because last October we lost the brilliant Scott Wilson who played Prairie/The OA’s father Abel. It would be a comfort to know he is at peace in the afterlife as I sit, with my window open, for the next leg of Prairie/The OA’s quest to find her lost companions in Dr. Hap’s ominous Neverland. © View From the Dark and viewfromthedark.ca, 2019. Unauthorized use and/or duplication of this material and original artwork or any other original artwork displayed on this blog without express and written permission from this blog’s author and/or owner is strictly prohibited. 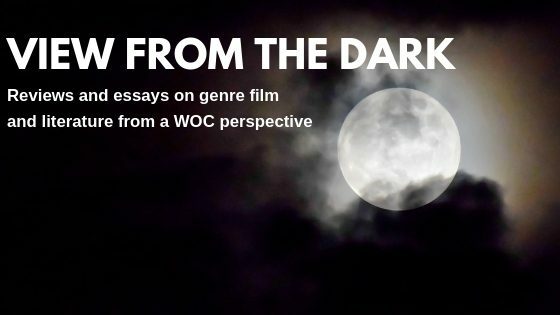 Excerpts and links may be used, provided that full and clear credit is given to View From the Dark and viewfromthedark.ca with appropriate and specific direction to the original content.